Bookshare is a non-profit seeding literacy for those to whom it doesn’t come easily. I’ve been dipping my big toe into the waters of how accessible literature is for those with print disabilities, something that recently grabbed my interest as I walked past the New York Public Library’s Andrew Heiskill Braille and Talking Book Library in Manhattan’s Chelsea neighborhood. While I’ve barely cut into the surface of this huge subject, I’ve had interesting conversations with several people who wear different hats in the world of the visually impaired: a teacher at a school for the blind, a librarian at the aforementioned NYPL branch, and a woman who secures contracts from publishers for a non-profit organization which makes content more available to those who need it. The more I learned, the larger the subject became (global, even), with a plethora of distracting corners in a Pandora’s Box of sorts. 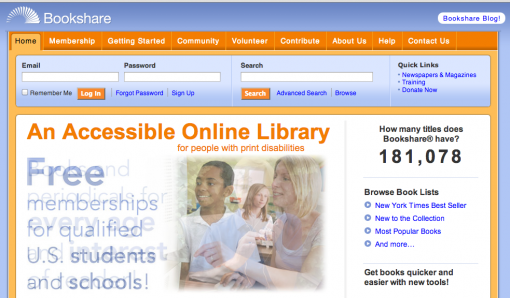 Bookshare, a non-profit wing of the larger philanthropic agency Benetech, is a member-based organization that provides content to those with an inability or difficulty to read print (known as print disability) in the form of DAISY book digital files (Digital Accessible Information System). Of their 250,000 members, approximately 240,000 of them are students who don’t pay for their memberships, largely thanks to a 5-year federal grant from OSEP (the Office of Special Education Programs). While this helps to push content into the scholastic population by offering free memberships, acquiring said content is a trickier and evolving issue. More and more publishers provide accessible, DAISY-compliant content to Bookshare at no cost. Robin Seaman, the Director of Content Acquisition of Bookshare, is on the front lines of this vast endeavor. She explained how she gathered the vast collection of material. Bookshare, which just celebrated its 10th anniversary, had relied solely on volunteers to scan materials and make them available. But this posed a problem: accessibility should have an element of timeliness, and needless to say, relying on volunteers means it was often unpredictable just when material would be made accessible. The politics of content accessibility are real. In the United States, copyright legislation has changed the course of literacy for future generations with a major tweak to copyright law called the Chafee Amendment (signed into law in 1996), which established that all content should be available for free in the United States to the following three populations: 1) those who are blind or have low vision; 2) those who are severely dyslexic, and 3) those with mobility impairment which would render them unable to hold a book or turn a page. In this post-Chafee Amendment world, Bookshare doesn’t need publishers’ approval to duplicate their material, but with their cooperation it certainly makes it easier, faster, and cheaper to get content into members hands as quickly as possible. “This process is political, in the best sense of the word…it’s been so gratifying for the publishers who are our partners in this social justice issue,” says Seaman. Even with their cooperation, the problem that remains is that the front end of the book publishing business could be smarter when it comes to producing books with accessibility in mind. This has led Benetech to shepherd forth a mammoth five year R&D undertaking called DIAGRAM, which aims to educate publishers about how to make content fully accessible for everyone from the very beginning of the process. They’re partnering with WGBH National Center for Accessible Media (NCAM), who has a solid track record in Accessibility, having spearheaded Closed Captioning. “Enhanced e-books are hugely challenging” in terms of converting the experience into verbal descriptions, but Bookshare is working apps to solve that challenge. As the technology of ebooks evolves, Bookshare’s own technology needs to continue evolving with it. “Novels and textbooks are no brainers — you scan them and make your digital file — but enhanced ebooks are hugely challenging, and so we’re working on specialized apps for things like embedded video,” says Seaman. The Chafee Amendment only covers domestic rights, and Bookshare is aggressively serving third world countries as well. They have a huge international presence with members from 40 countries around the world. “We work with libraries for the blind, and they help us get members. We have a lot of traction in India, Australia, and New Zealand, and we’re particularly interested in being in developing countries, such as Ghana and Kenya. We’re also in Qatar, and the United Arab Emirates,” says Seaman. The cause, she says, is spurred by nothing less than spreading democracy. Walking into the Albert Library for the Blind in New York, I was struck by how sparse the shelves were. The library is two stories. The first floor has a meeting room where the community congregates for lectures or other gatherings, a reference desk, a few shelves of blue-cased digital “Talking Books” (Talking Books are not analogous to Audio Books in that they sound robotic), and a few shelves of large-print books, which leaned heavily on the mystery and romance genres. Harry Potter would stand four feet tall in embossed Braille. Seeing the huge undertaking that is Braille makes it understandable that less than 5% of all published books (including periodicals, textbooks, and consumer trade) are available in an accessible format, whether embossed or digital. With Bookshare on the front lines of accessibility, hopefully this dreadful statistic will change.